Outlook is one of the most widely used applications in the world. In recent years Microsoft has expanded access to its beloved features by making versions of the software available on mobile platforms and enriching the capabilities of the clients for Windows, Mac and the browser. With so many users, it’s no wonder there’s a lot of ideas about how to make Outlook even better. Our customers and even internal employees of Microsoft often want to share those ideas but it hasn’t been clear how to do that until now. The Outlook Suggestion Box is the place to submit your feedback. 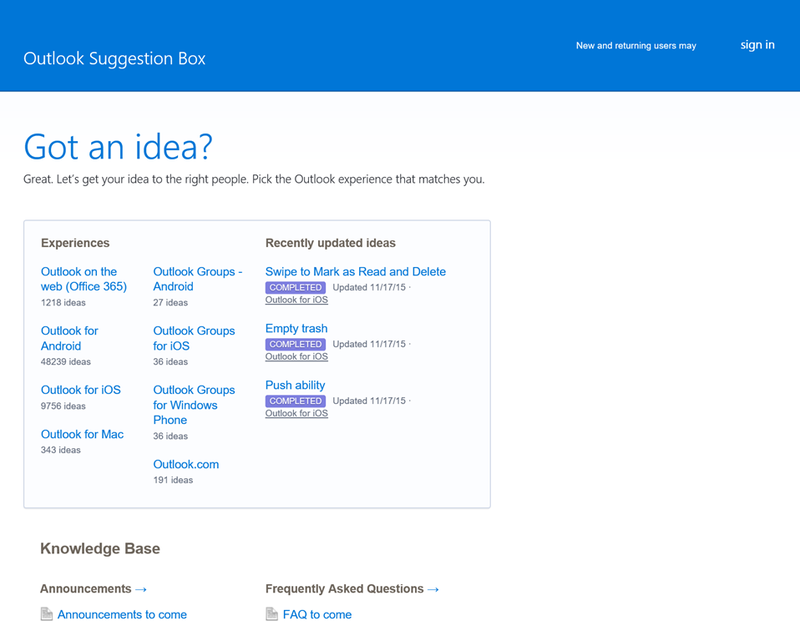 Leveraging the powerful UserVoice platform for product management, the Outlook Suggestion Box enables Microsoft engineers to gather customer feedback and product ideas in an organized manner so that your voice is actually heard instead of lost in a sea of emails, Yammer posts, etc. Click here today to signup and have your voice heard.